To complete the brand new Quad FX platform AMD is introducing three new processors today: the Athlon 64 FX-74, FX-72 and FX-70, running at 3.0GHz, 2.8GHz and 2.6GHz respectively. 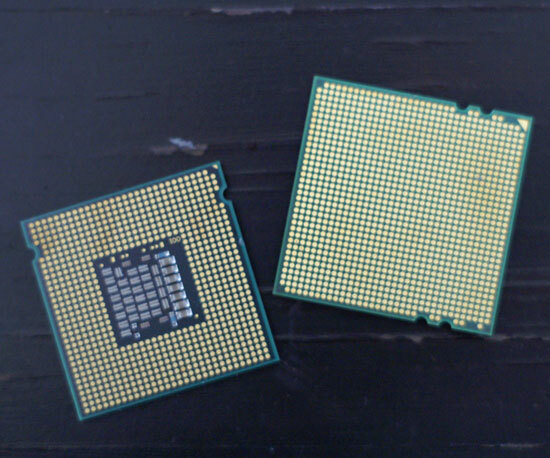 Each physical processor features two cores and a 1MB L2 cache per core, much like previous dual core FX processors, but what sets these CPUs apart from previous FX chips is that they are sold in bundles of two. 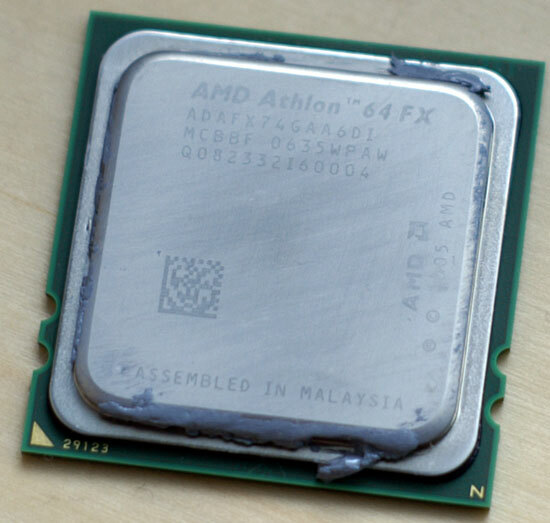 So when you buy an Athlon 64 FX-74, you are actually buying two dual-core CPUs in a single box. It's not the most elegant way of getting four cores, but it gets the job done and AMD manages to do so at a competitive price. Note that these CPUs are effectively Opterons but with the memory controller configured to support un-buffered DDR2. ** Note: The Core 2 Quad Q6600 is an unreleased CPU and will be introduced in January 2007. So for $999 you can either get two dual core 3.0GHz AMD processors, or a single quad core 2.66GHz Core 2 Extreme QX6700. Later we'll figure out which is indeed faster but it seems that AMD's pricing is at least competitive. When we first heard that Quad FX wasn't going to be Socket-AM2, we couldn't help but feel that AMD was introducing yet another Socket-940 into the mix. Is there really a future for Quad FX or is it nothing more than a stop-gap solution until native quad-core CPUs arrive? AMD has already committed to supporting two quad-core CPUs in current Quad FX platforms, so there's at least an upgrade path well into 2007, but what happens afterwards? AMD's most recent roadmaps show continued support for Quad FX throughout 2007; in fact, the highest clock speed AMD CPUs will always be Socket-1207 parts (3.0GHz today and then 3.2GHz by Q2 '07). It looks like AMD is transitioning the Athlon 64 FX line to be exclusively for the Quad FX platform, leaving all other chips for AM2. It strikes me as odd that you haven't reviewed a Dual Xeon 5300 system. While the motherboards aren't geared toward the enthusiast. It would seem anyone who could really benefit from two Dual core Athlon FXs would get incredibly more bang for the $$ out of a Dual Xeon 5300 system giving them 8 cores on an established and sure to be supported platform. I only see two major drawbacks to the Dual Xeon as opposed to 4x4. You don't have access to SLI. That's unimportant though as people who want SLI would be better served with an Intel QX6700 on an NVIDIA 680i. You need FB-DIMMs. Considering the expense you are already at with any Dual CPU system, and the types of activities you'd need to be doing to get real benefit. ECC probably wouldn't be a bad thing to have. To the best of my knowledge ECC memory is usually slower compared to non ECC memory. Also, if I didn't read it here, I read it somewhere else, not only is FB-DIMM memory more expensive, it also does not perform as well compared to standard DDR2 memory. As far as I can remember, using multiple CPUs (as in socket, not core), has always shown diminishing returns. In fact, I think I remember reading something to that effect here on this web site (or maybe it was TH?). Regardless, having several Dual CPU boxen around, and have had the chance to play around with a few Quad CPU systems, I've seen this with my own two eyes. I did not start reading this article with the belief that AMDs solution would beat an Intel quad setup, but I did have hopes that AMDS system would be at least feasible. The way I see it, from these results, AMD should have never even bothered with this design, and would have better spent their time working on future technology. he way I see it, from these results, AMD should have never even bothered with this design, and would have better spent their time working on future technology. As far as I can remember, using multiple CPUs (as in socket, not core), has always shown diminishing returns. Well... the parts that "barely squeak by" are also running at only 80% of the clock frequency... 2.4GHz Q6600 compared to 3.0GHz AMD FX... and Intel's Core2 architecture seems to have plenty of headroom to go to higher clockspeeds on Intel's whim... 3.6GHz overclocks are pretty common with the Core2Duo parts (and the Quad parts are the same exact cores). You can overclock an E6300 even higher on a lot of P965 boards than on the $225 ASUS P5W DH. 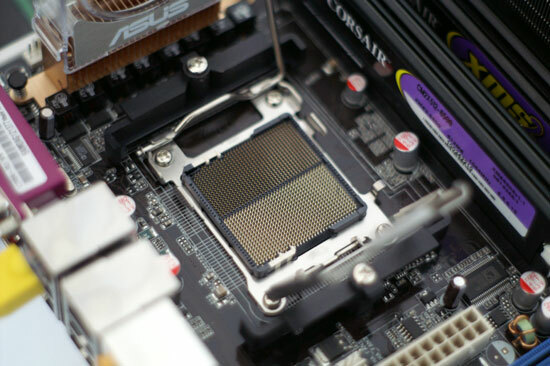 The motherboard chosen was used for consistency in benchmarking, not because it is the recommended "budget overclocking" motherboard for socket 775. As for QX6700 barely outperforming FX-74, there's a couple of things to keep in mind. First, you can't buy the AMD chips yet, whereas QX6700 is actually available (albeit a bit expensive). Second, the past indicates that 3.0 GHz is pretty clearly to limit of AMD's current chips on 90 nm. Meanwhile you have QX6700 systems shipping factory overclocked at 3.33 GHz and beyond. Sure, with that level of overclocking, the power draw might actually begin to be similar between the two platforms. However, a 25% overclock of a Core 2 Quad certainly isn't going to close the margins. And given that these are indigenous platforms we are talking about, overclocking is going to be far more common than not I would say. I'm not sure on Q6600 pricing either (since it's not available), though I've heard at least one rumor suggest the price has dropped to around $500. Guess we'll wait and see there as well. Basically, we are see Core 2 Quad beat AMD's latest and greatest in almost every test, without even pushing the clock speed limits. In seven months, we can evaluate again, and maybe AMD will have the lead.